Call to make your machine reservation then tell us the flavors you want to serve at your party. We’ll deliver the machine and set it up at least 1 hour before your party starts. Your first batch will be ready in 30 minutes or less! And there is no refreezing time with any additional batches you make. We will leave instructions (a very simple process) on making any additional batches of mix. When the party is over, just turn off the machine and we will do the rest. All of the above mixes are of the highest quality and are made with real fruit! Each machine rents for $150 a day for one or $130 each for two or more machines. * Each additional mix is $17 (remember you get one free mix with each machine rented). Each mix makes a little over 2 gallons of frozen product without any alcohol added. With alcohol, each batch will yield about 31 10 oz drinks. If you combine your frozen drink machine rental with a chocolate fountain rental, you will receive a $25 discount off of the total rental price. *applicable sales tax will be added to the final total. We accept cash, check, or Visa, Mastercard, and Discover Card for payment. 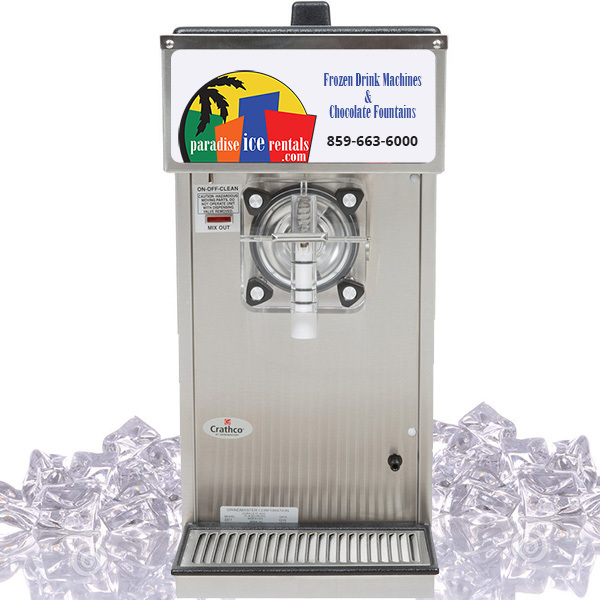 At Paradise Ice Rentals, we rent only restaurant quality frozen drink machines, not the lower end types that many rental companies have, which can take 2-3 hours to freeze the mix…not a way to start your party! Water. To speed up the freezing process, we recommend putting 3 gallons of water in the refrigerator and having it ice cold (not frozen) prior to our arrival. Also, if alcohol is going to be used, put that in the freezer. The colder the water and alcohol, the quicker the freezing time and the sooner the party starts! After we leave, refill the plastic mixing jugs that we will leave for your use and put back in the fridge for round two. The possibilities are endless. Birthday Parties, Wedding Receptions, Holidays, Cinco de Mayo, Super Bowl Parties, Graduation Parties, Kentucky Derby Parties, Pool Parties, Block Parties, Fundraisers, Corporate Events, Church Festivals…you are only limited by your imagination! Call 859-663-6000 to reserve your frozen drink machines. On holidays, reserve early as machines go fast! What Are You Waiting For? Reserve Yours Today!